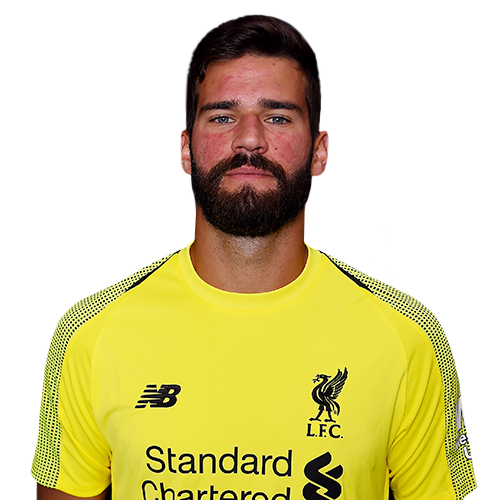 Alisson became Liverpool's fourth signing of the 2018 summer transfer window on July 19. Born in Novo Hamburgo, a Brazilian municipality named after Hamburg by the German immigrants who founded it in the 19th century, Alisson was just eight years old when he took his first steps into the professional game. His hometown, nicknamed the 'National Capital Of Shoes' thanks to its reputation as a hub of footwear manufacture, boasts a lower-league club of its own, but he followed older brother Muriel Gustavo Becker in joining nearby top-flight side Internacional as a youngster. Alisson's choice of position was also influenced by his elder sibling, and it is this fact that led to the pair competing for a spot between the sticks in the first team in the years after they had progressed through the youth set-up. The younger Becker first successfully dislodged his brother on February 17, 2013, making his senior debut in the state competition, Campeonato Gaucho, for a 1-1 away draw with Cruzeiro. That summer, he also caught the eye of scouts as he helped Brazil's U21s win the prestigious Toulon Tournament, keeping a clean sheet in a 1-0 win over Colombia in the final. A first outing in the national division, Serie A, followed in August, but Internacional's goalkeeping options, which already included Muriel and Agenor, were soon boosted by the arrival of the legendary Dida from Gremio. The latter featured most regularly over the next few months but, after he was sent off during a 5-0 defeat by Chapocoense in October 2014, coach Abel Braga finally turned to Alisson as his first choice. The Brazilian retained his spot from that point onwards as the 2014 and 2015 Campeonato Gaucho titles were secured, with the latter season featuring a run to the semi-finals of the Copa Libertadores. Alisson's first call-ups to the senior Brazil squad in September 2015 failed to result in a maiden cap but the following May he debuted in a 2-0 away win over Panama, subsequently earning himself the No.1 jersey for that summer's Copa America. The goalkeeper's rapid ascent had not gone unnoticed in Europe, and it was AS Roma who fought off competition to swoop for his signature in July 2016. But his first season in the Italian capital saw him make just 14 appearances - all in cup competitions - with the on-loan Wojciech Szczesny firmly embedded as the man between the sticks. However, the departure of the Polish shot-stopper the following summer allowed Alisson to step into the breach, and he enjoyed a memorable first campaign as No.1, helping Roma to the Champions League semi-finals while securing qualification for next year's tournament. And, in the meantime, he managed to establish himself as first-choice goalkeeper for the Brazilian national team ahead of Manchester City's Ederson and Cassio of Corinthians. Alisson underlined why he had been chosen as No.1 by helping his country to the quarter-finals of the World Cup with a string of impressive performances in Russia over the summer. Now he turns his attentions to a new challenge at Anfield after agreeing to become the latest exciting addition to Jürgen Klopp's squad.